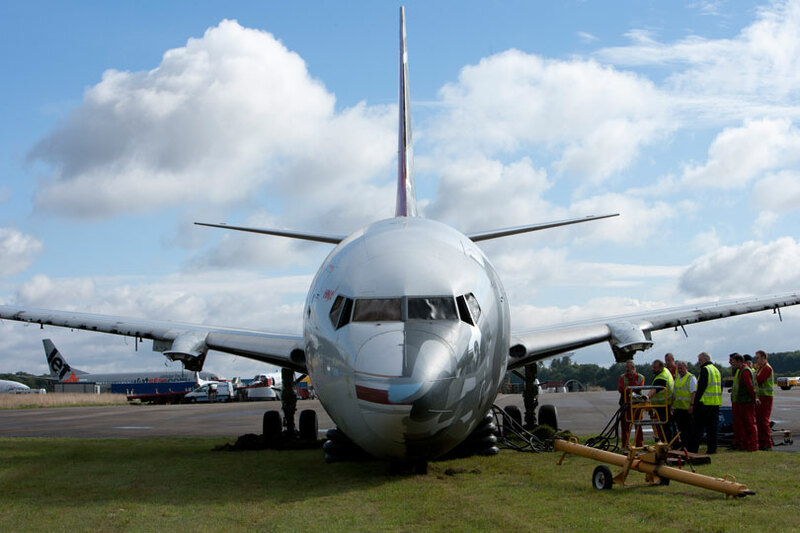 During the lifting operation, the aircraft should be stabilized using hand operated tethering winches. This will enable the aircraft to resist horizontal loads imposed upon the aircraft by wind or incorrect air bag pressure. The AMS winch is manufactured from stamped steel casing with reinforced shaping. It has double galvanized protection, and is lightweight, strong and includes transportation handles. All cables supplied have been galvanized to prolong life expectancy. As a recommendation, four tethering sets should be used for a narrow body aircraft, while wide body aircraft generally generally require six sets. As each winch is independently operated, the operator can keep the aircraft in a level attitude at all times, under the direction of the team leader. The winch has a forward and reverse action with a 50mm (2”) stroke. Safety Note. It is now recommended by the Boeing and Airbus aircraft manufacturers that load cell measuring devices are used wherever load is applied to aircraft during tethering and hauling. AMS can provide load cell devices for all recovery situations.